"What's better company to keep than one monk and one samurai?" What sounds like the lead-in to a terrible joke is how Max Fortgang begins talking about matcha, a bright-green Japanese powdered tea. Max is the co-owner of MatchaBar, which he shares with his brother Graham. He explains that 11th-century Zen monks drank this bitter tea before meditation for its calming quality. Several-hundred years later, matcha became popular among samurai for its caffeine. Fast-forward another few hundred years to modern-day Brooklyn where commuters have adapted the ancient tea ceremony associated with matcha in to-go cups with a splash of almond milk. Left: Always put matcha through a sieve to remove clumps. 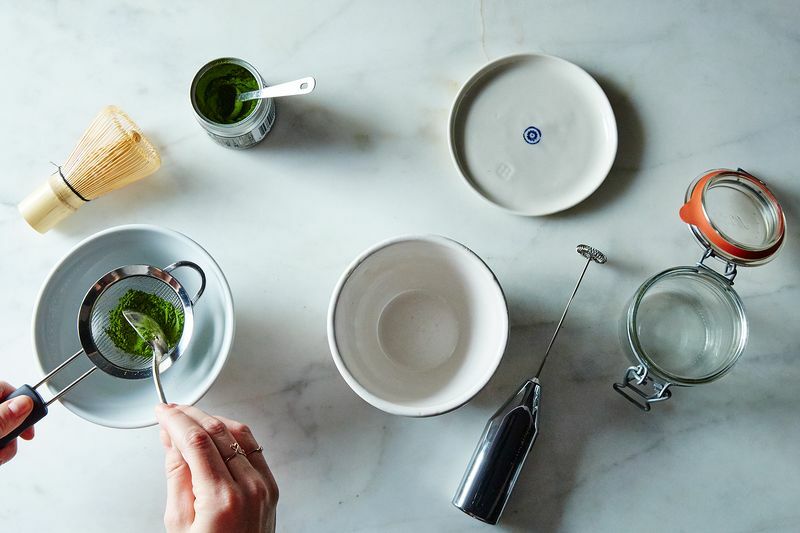 Right: Three different preparations of matcha. There are two main classifications of matcha: ceremonial grade and culinary grade. 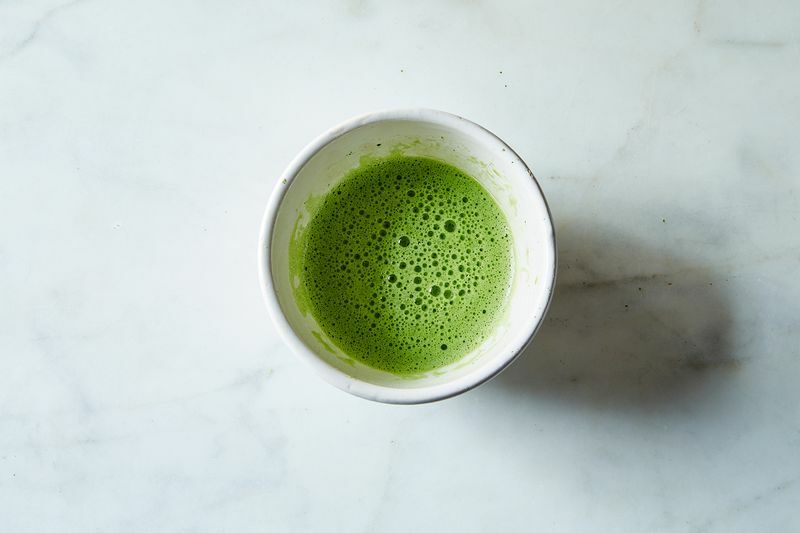 Culinary-grade matcha is generally used in matcha-flavored foods (hey there, matcha pops) and is from mature leaves further down the green tea plant with little nutritional value or caffeine. 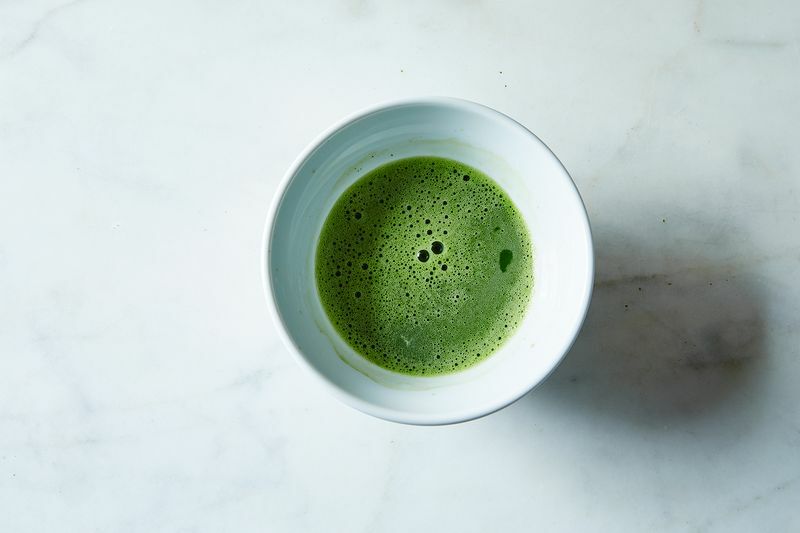 Ceremonial-grade matcha uses younger leaves that are higher on the plant (the best is from the leaves at the tip of the tea plant), and is what Max and Graham recommend—plus, it's healthier. Matcha isn't nearly as acidic as coffee (in fact, it's a base! ), and it contains antioxidants like catechins that protect the body from free radicals and increase the time it takes for the caffeine to break down (that's where the smaller crash comes from). The Peaches and Cream drink (or is it the Irish flag?) at Matchabar uses peach juice, almond milk, and matcha. 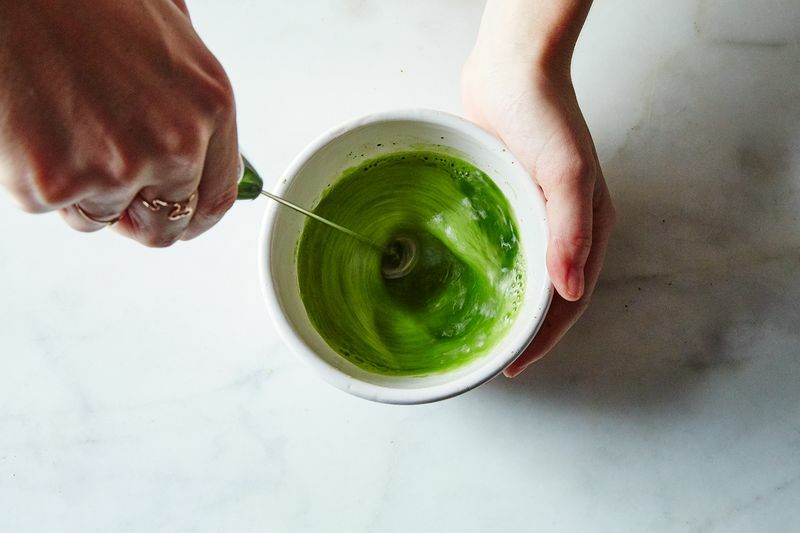 Modern iterations of matcha (those in the aformentioned to-go cups) can be made into either cream-based, coffee-inspired drinks or fruit-based, iced refreshments. For the coffee-inspired drinks, matcha can be used in the same way you'd use a shot of espresso, with the same ratios of milk. One teaspoon of matcha plus roughly 1/2 cup of water is equal to one shot of espresso, for these purposes. For example, MatchaBar serves something called a Flat Green, their matcha version of a flat white. Graham explained, "What we’re trying to do is make an unfamiliar product more familiar." 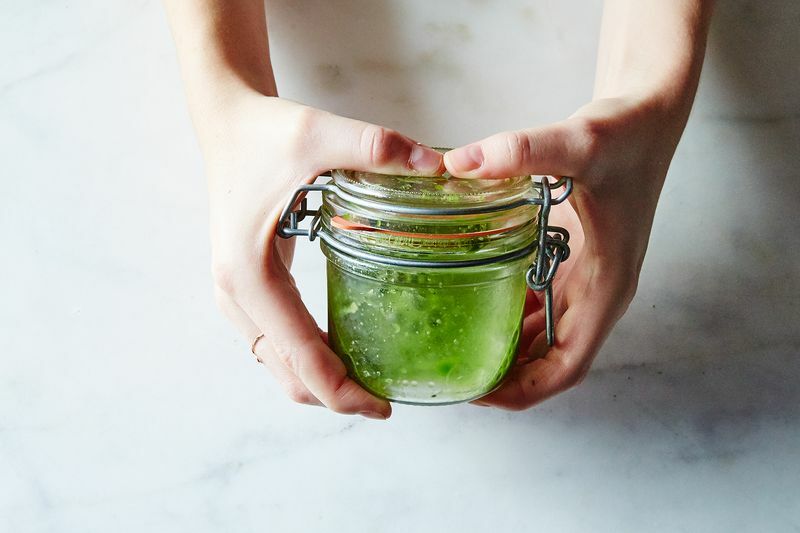 Fruit-based iced matcha drinks work in the same way lemonade does with tea in an Arnold Palmer. Max explained as I sipped a peach and matcha drink, "In the tea industry, one of the main ways you get people to start drinking it is to put lemonade in it, which is a very basic move that's opened up tea to a lot of people." He explained that matcha is a perfect canvas for a whole range of flavors and often brings out earthy tones of other ingredients. At MatchaBar, he mixes it with watermelon, peach, and fuji apple, among other juices. 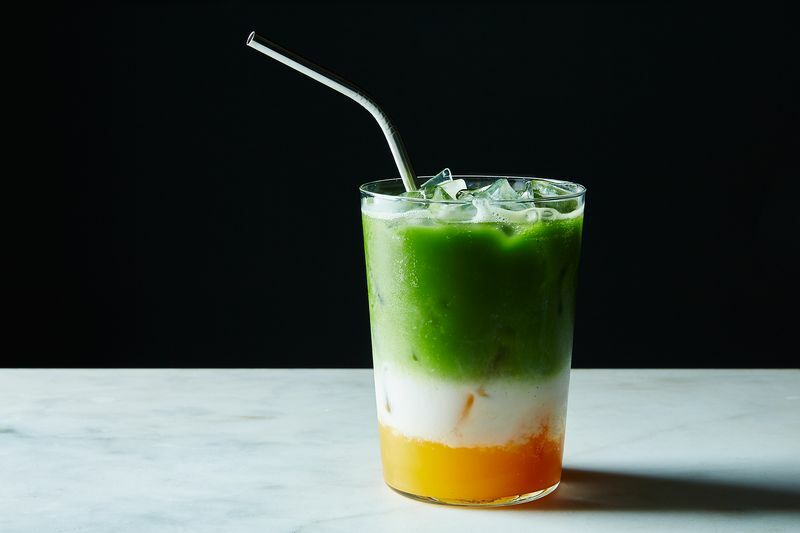 To do the same at home (and make the Peaches and Cream drink pictured above), fill a twelve-ounce glass with ice, then add 4 ounces of the fruit juice of your choice, and top with roughly 6 ounces of matcha, or 1 1/2 times as much matcha as juice. Matcha is traditionally made with a tea whisk. 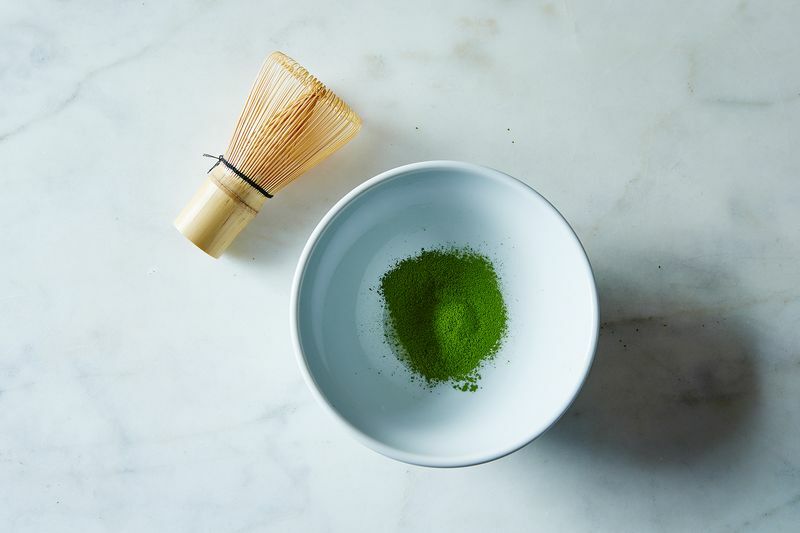 To use one (and if you don't already have one, they retail for about $15), scoop 2 grams, or roughly 1 teaspoon, of matcha powder into a small bowl with relatively high edges so that the tea doesn't go overboard. Pour 1 cup boiling or cold water over the tea (matcha doesn't dissolve in water, it's just "suspended" as Max says, so the temperature of the water doesn't matter), and whisk quickly in a double-U or zig-zag formation until little bubbles start to form. Continue whisking until all of the clumps are broken up and the top of the tea is covered in a thin layer of foam. This takes about a minute. 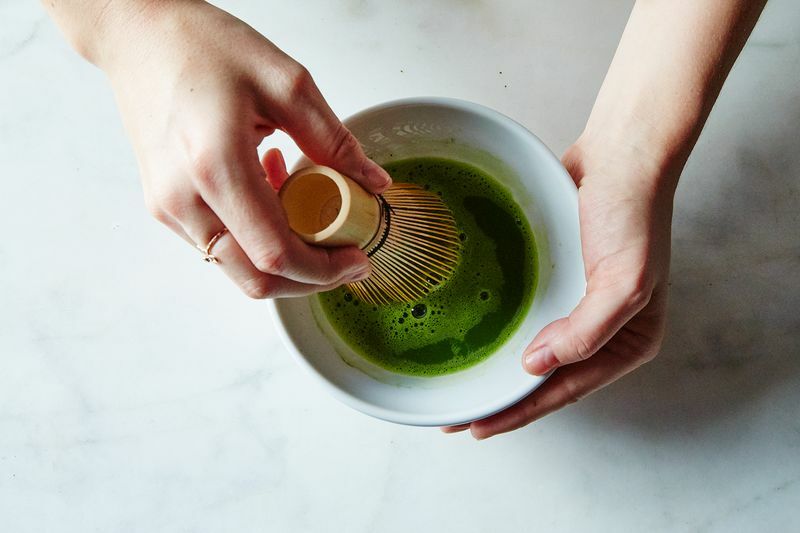 As with the whisk method, add 1 teaspoon of matcha to a small bowl with 1 cup of water over it, then use an electronic milk frother to create a layer of foam and break up all the clumps. Unlike the whisk method, which can take up to a minute, this method can take as little as 10 seconds. Not all hope is lost! Max and Graham suggest sourcing a small airtight container with a secure lid. Add to it 1 teaspoon of matcha, 1/2 cup of cold water, and some ice cubes (the ice cubes help break up the clumps in the powder). Close the lid and shake the container vigorously until the matcha is fully suspended in the water. 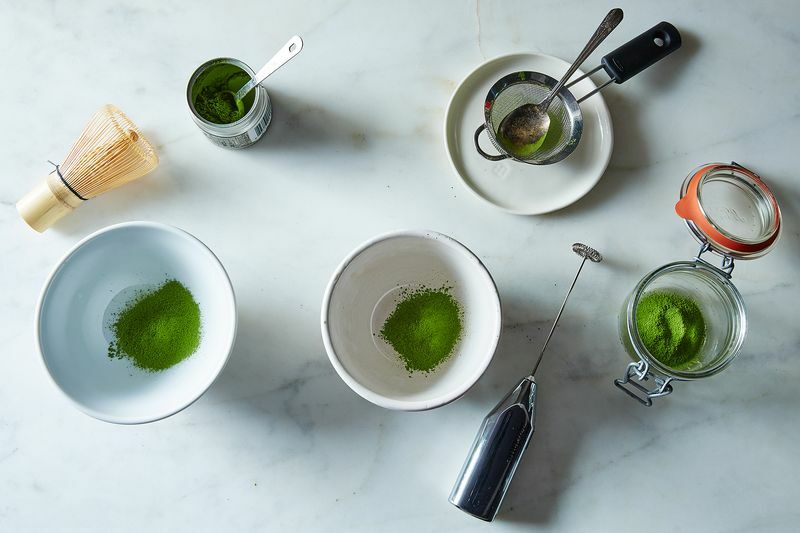 To Max and Graham, there are several ways to make matcha tea that diverge from the original ceremony, but the drink itself is an art. As Graham puts it, "I would have a painting of Max's Peaches and Cream in my house if I could." What's your preferred way to enjoy matcha? Do you think Peaches and Cream should be reserved for the classic dessert? Tell us in the comments below! I'm curious as to what evidence/bio-science there is that matcha "releases the stimulant (caffeine) over a longer period of time" than coffee? I'm suspicious that this might be like the agave rumour, that was all over the net several years ago, that agave was absorbed by the body 'slower than sugar'.... Does this strike anybody else as a suspicious? From the Domatcha recipe book -Add some spice to your routine with this terrific chai recipe. Bring almond milk and spices to a boil. Boil for 5 minutes, then simmer for 10 minutes. Strain into a blender. Let the mixture cool down for a few minutes, then add 1 teaspoon of DōMatchaTM and blend. You can also make a DōMatchaTM Chai Frappe by blending with ice. Do not recommend at all to use boiling water-optimal water temperature is 70-80C. Otherwise you kill a lot of volatile oils that make matcha so precious and delicious. I am lucky to live close to Japan and get my matchas on straight after they are packaged at this small family plantation. Like Sue Manos, I make lazy shaken matcha but I add a pinch of ground cardamon—a surprisingly delicious and warming addition. I sometimes make mine with a flavored green tea. Also I like to put my matcha in a water bottle and shake it up. I use 1/2 tsp per 8 oz of water. (My whisk came with a bamboo spoon.) I find using any kind of metal gives the matcha an off taste. And boiling water kills the antioxidants. Favorite hot comfort drink around my house: Warm almond milk or coconut milk with just a drop of agave sweetener and a nice dollop of matcha. I buy good Japanese matcha and have never had clumping problems that require any kind of whisking exertion, electric or otherwise! While $20-25 for a small tin seems pricey, remember that just a teaspoon goes a long, long way. If Matcha has a slow release caffeine content it may interfere with sleep for those who are sensitive to caffeine and drink it after noon. Also, use of any Chinese manufactured food or cosmetic product should be done with the greatest caution. The cheap Chinese matcha can contain more lead than is good for us. The Japanese teas are typically "lead-free". Again it's a case of "good food ain't cheap and cheap for ain't good." So don't be cheap with your healthy foods and you'll be just fine. I don't see the actual Matcha Peaches and Cream recipe--am I losing my mind? Where is this "below" that's referenced? I agree, looked for a while but couldn't find it. I see there's been an edit that takes out the "below" reference, but the description of how to make Peaches and Cream still doesn't mention the cream. I assume it's almond milk and that you just pour it on top of the fruit juice. Hi Judith2b and Helen, to make the Peaches and Cream, simply use the ratios provided, then use almond milk (as the "cream" component) and then pure peach or apricot juice. It's that simple—and really delicious! 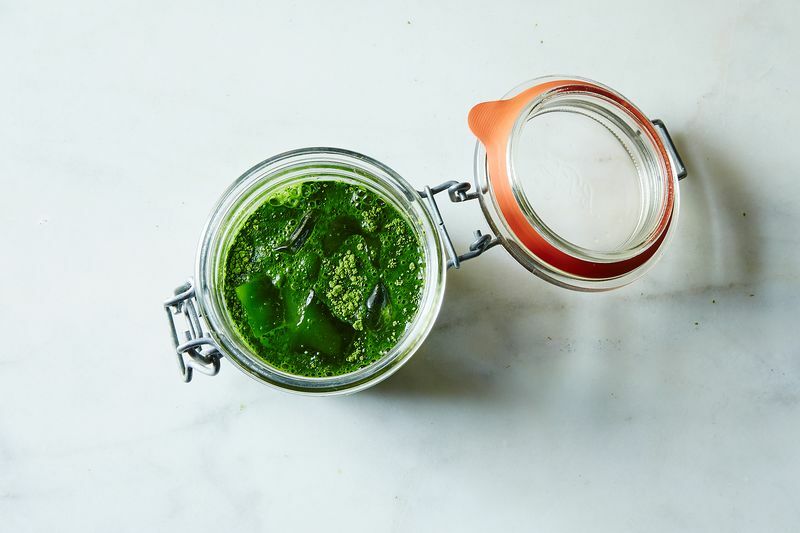 The recipe is confusing and should be revised to read 4 ounces of juice, 4 ounces of almond milk and 6 ounces of matcha. I have a large shaker bottle with a little shaker ball. I add room temp filtered water, add 2 servings of Matcha and shake till all lumps are gone. I then either pour over ice with a splash of almond milk or into a mug to be heated. The large bottle is 2 servings. While I like the idea of preparing matcha in the tradition of the Japanese, being pressed for time, this is the way I have found the easiest and fastest while still reaping all the benefits of this awesome drink. I've read that matcha can be high in lead (I think it's lead?) or some other scary metal/contaminant. Does anyone know more about this? Can I use matcha in my Filron and still receive the benefits? Adding water that is greater than 176deg F (80deg C) will destroy a lot of the antioxidants contained within Matcha. I am very interested in the Matcha history and new recipes :). Do you have any books concerning Matcha you can recommend ? I heat some almond milk, a teaspoon of coconut oil, maca, and matcha in a small saucepot until warm. I blend it on low in my Vitamix until it is foamy and drink it latte-style. Best ever! The caffeine content is off by three orders of magnitude. There is a big difference between milligrams and grams. I would fix this. Right you are! The article has been edited to reflect the change—thank you for your sharp eyes!